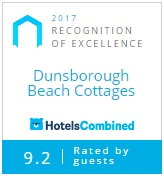 Dunsborough Beach Cottages is located in the heart of the Margaret River Region, just 2.5 hours south of Perth and is situated on the pristine waters of Geographe Bay. We offer visitors to the region a range of beautifully appointed self-contained 2 & 3 bedroom resort style cottages, including our adults only beach front cottages, which makes us the ideal place to stay while you explore this diverse holiday destination. During your stay at Dunsborough Beach Cottages, you can experience a range of tours and attractions, all within one holiday. From ancient caves, heritage lighthouses, to nature walk trails through Meelup Regional Park which is some of the most picturesque coastline in the region, Dunsborough is truly one of the special places to visit in Western Australia. So if you’re ideal holiday includes thoughts of visiting award winning wineries, local artisans at their galleries, enjoying delicious local produce and grazing through one of the many restaurants on offer, then be sure to speak to us today about how we can help you book that break you really deserve. Hosts, John & Margaret look forward to welcoming you to Dunsborough Beach Cottages on your next holiday. Stylish cottages suitable for a couple or small families. Spacious living areas for families travelling together. Luxury adults only retreat, suitable for up to 4 people.